A few years ago we enjoyed a magical Christmas in Cornwall. We hunkered down in our luxury cottage, ate turkey and only ventured out if there was promise of sparkle and festive fun. And we found plenty. If you are in the South West this December then here are some of the best things to do in Cornwall at Christmas in 2018. You might also like to read my top Christmas days out in Devon and festive events around the UK. From grottos to illuminations and markets to carol singing, you’ll find plenty of places to visit in Cornwall with kids this winter. Here’s where to head for festive spirit and maybe even a mulled Cornish cyder! Hear this Christmas classic read at the Museum in Falmouth by radio presenter Mark Crees. National Martime Museum, Falmouth. 14 and 21 December 2018. Booking essential. Make vintage Christmas decorations at the Telegraph Museum during 90 minute workshops between Christmas and New Year. There will be plenty of other festive activities happening at this interactive museum in the run up to Christmas. Find out more about visiting this top Cornwall attraction. Telegraph Museum, Porthcurno. Workshops take place at 11.30am and 1.30pm from 28 to 31 December 2018. Normal admission prices apply. The Winter season starts early at The Eden Project in Cornwall with the annual ice rink opening from October half term. You can go along for fun on the ice with penguin skating aids for little ones or get serious with lessons. Eden Project, St Austell. 13 October 2018 to 24 February 2019. Booking essential. Buy tickets for the ice in addition to Eden Project admission. Lost Gardens of Heligan, Truro. 12 December 2018 to 5 January 2019. Tickets are £6 per person for timed ticket slots. The garden of this stately home on the River Fal will be lit up for evening visitors. Take a look at our visit to Trelissick’s house and gardens during our last Christmas in Cornwall. Trellisick, Falmouth. From 4pm to 7pm on selected dates from 30 November to 31 December 2018. Normal admission charges apply. Free for members of the National Trust. A dazzling 7,000 lights will illuminate this pretty Cornish fishing village over the festive season. For a taster take a look at the harbour picture at the top of this post. Mousehole Lights, Mousehole. From 6pm to 11pm each evening from December 15 2018 to January 4th 2019. Free to attend. See the town and harbour lit up with illuminations of all shapes and sizes each evening into the New Year. Padstow illuminations, Padstow. from 1 December 2018 to 6 January 2019. Free. A new spectacular light and sound experience – Shadows and Light -is coming to the Eden Project at Christmas 2018. See the biome lit up with glowing colours and lights dancing to festival music. There will also be light installations in the gardens outside. We loved the Festival of Light which we saw at the Eden Project a few years ago. Eden Project, St Austell. 5-8pm on selected dates between 24 November and 30 December. Included in standard entry price. Father Christmas will be by the log fire in the Head Gardener’s Office where visitors can meet him and post their letters. There will also be Christmas workshops and a magical Christmas Trail around The Lost Gardens. Lost Gardens of Heligan, Truro. From 15 to 24 December 2018. Normal admission applies. Meet Santa and his friends in the Magical Woodland Den at Retallack Resort. Kids of all ages can create their own crafty Christmas presents in the workshop and meet all of the festive companions such as elves, Unicorns may also make an appearance. There will be edible treats, comforting hot chocolate as well as a present for each child from Santa himself! Retallack Resort, St Columb Major. Each Thursday, Friday and Saturday from 1 December 2018. The price is £10 per child. Under 2s are free of charge. It is £5 to see Santa with a Christmas present. Visit Father Christmas in the Great Chamber to hear tales and traditions of Christmas. There’ll be five thirty minute performances on each of the performance dates (see the website), tickets are £4 for children, £3 for adults. Admission applies and tickets are available online with a limited percentage available on the day. Trerice, Newquay. Selected dated from 1 to 23 December 2018. Tickets are £4 for children, £3 for adults. Normal admission prices apply and members are admitted to the property. Tickets are available online with a limited percentage available on the day. If you’re looking for a way to celebrate Christmas with family and friends before the big day then check out the family Christmas parties at China Fleet Country Club in Saltash. Have a two course carvery, let the kids enjoy crafts and face painting, and then Meet Santa in his grotto. Here’s our review from the 2018 Carvery with Santa at China Fleet Country Club. China Fleet Country Club, Saltash, Booking essential. Board this special service at Bodmin General Station where you’ll find festive treats before your hour long Santa train experience. During the ride there will be a visit to Santa’s grotto with gifts for children. There are two autism-friendly services too. Check out our visit to Bodmin & Wenford Steam Railway at Easter. Bodmin & Wenford Steam Railway, Bodmin, Selected dates 1 to 23 December 2018. Booking essential. Come along every day over the Christmas period, expect Christmas day itself, to see the the animals. Or why not book into Santa’s Grotto on two special dates. Children will receive a special trail sheet and treat. There’s also an elf’s silent disco. Newquay Zoo, Newquay. 15 and 16 December 2018. Santa’s grotto tickets are £7.50 and silent disco tickets are £3, both in addition to the normal admission charge. See Santa in his grotto at Europe’s largest indoor rainforest. Go behind the scenes to see where the elves sleep and work. Eden Project, St Austell, 24 November to 24 December 2018. Booking essential. Buy tickets for the ice in addition to Eden Project admission. Looking for more inspiration for things to do in Cornwall? Read our guide to family holidays in Cornwall. Come and see Healey’s Cornish Cyder Farm showcase stalls of tasty local produce alongside Cornish art and crafts every weekend in the run up to Christmas. 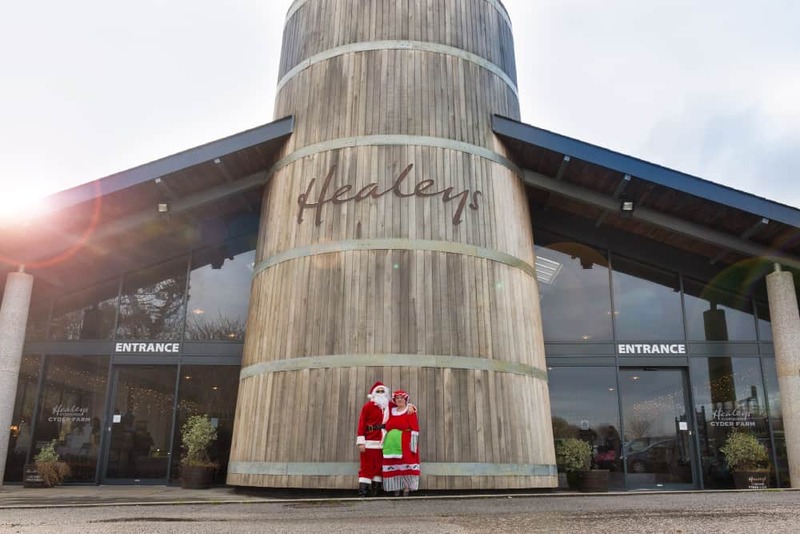 There’s the opportunity to pick freshly cut Christmas trees and try the range of Healeys Cornish cyders for free in Healeys own farm shop. It’s a full, fun day out for the family. You can also go on Cyder making tours and tractor rides down to 20 acres of orchards run regularly throughout the day whilst the friendly farm animals, including donkeys, pigs, goats, ponies and shire horses are a favourite for little ones to meet. Healey’s Cornish Cyder Farm, near Newquay. Every weekend from 23 November to 16 December 2018.Entry to the farm and parking is free all year round. Charges apply for tours and tractor rides. More than 100 of the best local food producers, artisans, creators and makers will be at The Lost Gardens of Heligan for its annual Christmas Fair. Unique food/drink, jewellery, art, ceramics and more, will be on sale, and mulled wine and seasonal treats available. Lost Gardens of Heligan, Truro. 8 and 9 December 2018. Free entry for Heligan Annual Members Free; local pass holders £1; £2 everyone else including garden entry. Find a unique Christmas gift at this festive show featuring crystals and crafts. You can also go on a guided tour of the caverns. Carnglaze Cavern, Liskeard. 10am to 5pm, 1 and 2 December 2018. Gift show and garden entry £2 and under 16s free. Guided tours £20 for a family of two adults and two children. Eighty local crafter and businesses will have perfect Christmas presents on sale at this fair set across the Flambards park. Visit for a specially reduced rate and enjoy the fair, the Victorian Village and Britain in the Blitz experiences. Flambards, Helston. 1 to 2 December 2018. Entry £1 all weekend. Join in with a carol concert being held in aid of St Luke’s Hospice at Pentillie Castle in Saltash. The Liskerret Male Voice Choir will be leading the festive sing along in the castle’s courtyard. The event is free to attend but donations will be taken to support the work of St Luke’s. Pentillie Castle, Saltash. Wednesday 12 December 2018. No booking required. Join in with pre-Christmas festivities in the Lookout Lounge with swinging brass bands and local schools playing and singing merry Christmas carols and joyful classics. Devour a delicious mince pie whilst enjoying the warming comfort of mulled wine or you can opt for a special Retallack Christmas cocktail or refreshments from the gin bar. Retallack Resort, St Columb Major. 23 December 2018. As well as illuminated gardens at Trellisick this Christmas visit the house to see it decorated in a festive fashion. You can also meed Santa’s reindeer in the stables as they have a rest before Christmas Eve. Trelissick, Falmouth. Illuminations and house open on selected dates from 30 November to 31 December 2018. Meet the reindeer on 1, 8, 15 and 22 December between 11.30am and 2.30pm. Each year there is a festive flower garland in the Grand Hall at Cotehele. This year the garland will also commemorate the end of the First World War. West Country print-artist, Dominique Coiffait has worked with the garden team to create this year’s special display. Cotehele, near Saltash. Selected dates from 10 November 2018 to 6 January 2019. Normal admission charges apply and members are free. See the extraordinary kitchens at Lanhydrock in preparation for a very Victorian Christmas feast. Try your hand at making puddings and gingerbread. The foodie Christmas theme continues in the gardens with a festive trail for children. Lanhydrock, Bodmin. From 11am until 4pm very day except Christmas and Boxing Day. Normal admission charges apply and members are free. The barn ceiling all be adorned with 2,600 hand painted golden stars. You can also meet Santa at Trerice in December. See above. Trerice, Newquay. Normal admission prices apply and members are free. Can Good Old Fin save Christmas? Find out during this short festive show at Godolphin. Godolphin, Helston. Selected dates between 12 to 30 December 2018. Tickets cost £4 and booking is essential. If you’re looking for more places to visit in Cornwall then we can recommend days out when it’s raining in Cornwall and dog-friendly days out around Cornwall. Or why not read our guide to family holidays in Cornwall. Why not pin this post about what’s on this Christmas in Cornwall for later?